The Licensed Customs Broker Exam is a rigorous exam that primarily tests knowledge of Customs import compliance. The pass rate for this exam has ranged from as low as 3% to as high as over 30%. The main reasons for the low and variable pass rates appear to be inadequate preparation by most candidates and varying degree of difficulty of the tests from year to year. This website aims to meet the need for proper preparation by providing the tools and study material to help you be much better prepared to pass this exam. The material to be studied is vast and covers many different topics. However, this is an open book exam and we have analyzed past exams to identify the most tested topics that you need to study to be able to pass this exam. Free users have access to one set of lessons on one topic, quizzes on that topic and one practice exam. Paid users have access to all study material, all quizzes and all 20 practice tests. Give yourself adequate time to prepare and start your preparations early. If you are working full time, like most test takers are, you may need anywhere between 3 to 6 months’ time or more for proper preparation. As a first step, read and review these instructions completely and follow them in a systematic and disciplined manner. Next, read the lessons carefully and read the recommended reference material. The lessons are arranged in decreasing order of importance and so lessons on the most tested topics are presented earlier. This ensures that even if you run out of time for preparation, you will be more likely to cover the most important topics. 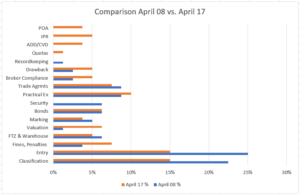 A comparison of the April 2008 versus the April 2017 test shows that while classification and entry remain the most important topics, questions from these topics have reduced slightly since 2013 to accommodate more questions from ADD/CVD, IPR, POA and Quota. Therefore, the less important topics cannot be ignored now. For each lesson, you must refer to the assigned reading material. When you read the referred material, you should try to understand the material and remember where the material is in the regulations or references, so that you can find it later, to quickly to answer questions. Using tags to tab your material is good practice as it helps you locate the relevant rule or regulation quickly in your printed reference material. You may need to repeat your reading a few times to gain good understanding and familiarity with the material. After you have read the material, take the practice quizzes to test your knowledge. These quizzes are not timed, and you must practice referring the regulations and other reference material to answer the quizzes. This will reinforce your understanding of the material and improve your ability to quickly locate relevant material among your printed material. As you read the material, tab and label relevant parts of the printed regulations and other material so it will be easier for you to find relevant material to answer questions. You can refer only to printed copies of the regulations and other reference material, so it is important to label the material for easy access. Familiarize yourself with the rules for classification and valuation in the reading material as these are especially important for the test. Once you have completed reading the material several times and taken all the practice quizzes, you should be well prepared to take the practice tests. There are 20 online practice tests drawn from old exams that are administered under timed conditions. This helps to replicate actual exam conditions. Practicing with these 20 old exams helps you become even more familiar with the type of questions asked as well as the location of the material. It also provides you with lots of test taking practice which is extremely important. As you practice each test under timed conditions, you will receive your score at the end of each test and you will know whether you need to do more reading or whether you are already at a passing level. You will also have access to graphs showing your progress in each tested topic over the different tests. This will help you identify areas of weaknesses and strengths. If you observe that you are scoring low in certain topics, it may be a good idea to go back to the lessons on that topic and review it again as well as retake all the quizzes on that topic. As you take the practice tests, if you have doubts on checking your answers with the correct answers, you can post your questions on the Forum and receive clarifications from both the faculty as well as other students. This discussion forum clarifies doubts and helps you learn from others. The Forums have one category for each exam and under each category, there are topics for each question in that exam. You will be able to access the Forums only for those tests which you have completed. This is to prevent users from looking up the answers in the forum before taking a test. If you read all the lessons several times, take all the quizzes, do all the 20 practice tests, you will know from your scores and graphs, how well you are doing and how ready you are to take and pass the exam. If you sincerely and seriously follow these instructions in a disciplined manner, you should be very well prepared to pass this exam.